Cleaning your car doesn't have to take hours if you know a few shortcuts. Here is how to clean your vehicle on only a few minutes. Spray the car with a hose so that you get all that trapped dirt and debris from the surface. 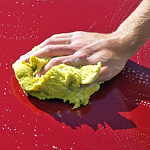 Wet a microfiber cloth with one-step wax, and start polishing the exterior. To avoid those water drop from staining, drive the car around the block and the wind will remove them easily. Take the floor mats and bang them on the ground to get rid of the dirt or debris. use a paper towel and some cleaner to polish those windows to a fine shine. Use a paintbrush to get dust and dirt out of things like the vents and the finer crevices of the car dash. If you want to upgrade your ride, visit Audi Salt Lake City and take any of the vehicles for a test drive.